Finally, I can now show the quilt I was working on for the last couple months. I like to keep it secret till after the MQS quilt show. It was fun to work on, tried some new techniques, and, even though it didn't win anything, I still love how it turned out. (it was held for consideration for it's category and Judges Choice). 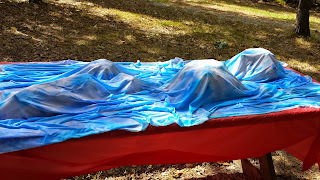 Last summer, while camping, I played with painting fabric. 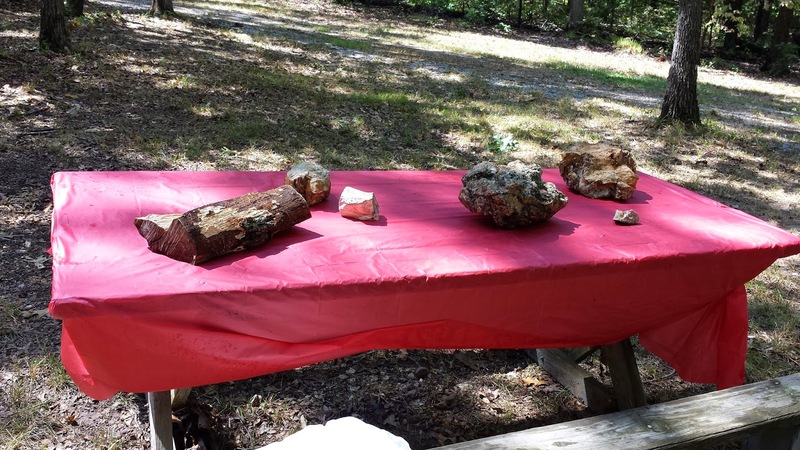 I placed a bunch of rocks and logs on the picnic table to create hills and valleys. I then draped the Kona PFD fabric over my piles and painted away at random. 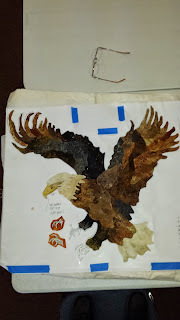 Next, I created my Eagle Applique. I've been working on this pattern for a couple years. I started with a photo I took years ago when Hubby and I were on vacation in Minnesota. Each time I've used my pattern, I've increased the number of pieces. Now I'm up to over 70. There is no sewing on this piece until I get it on BeBe, my longarm. 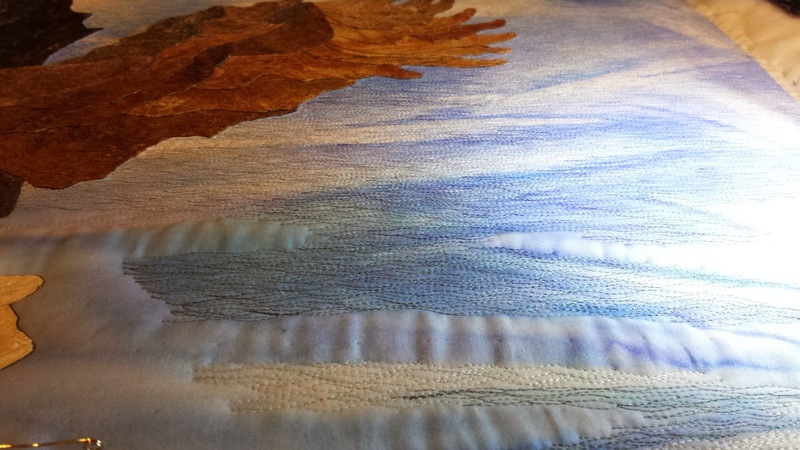 All edges are turned under and machine appliqued on BeBe. 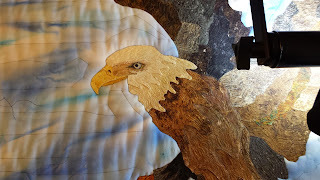 My Eagle is made using only Stonehenge fabric. I completely stabilized the background, placed the Eagle, and started having fun! My Eagle is thread painted using only Fantastico, Lava and Rainbows threads from Superior Threads. I then outlined the Eagle parts with King Tut, also by Superior. 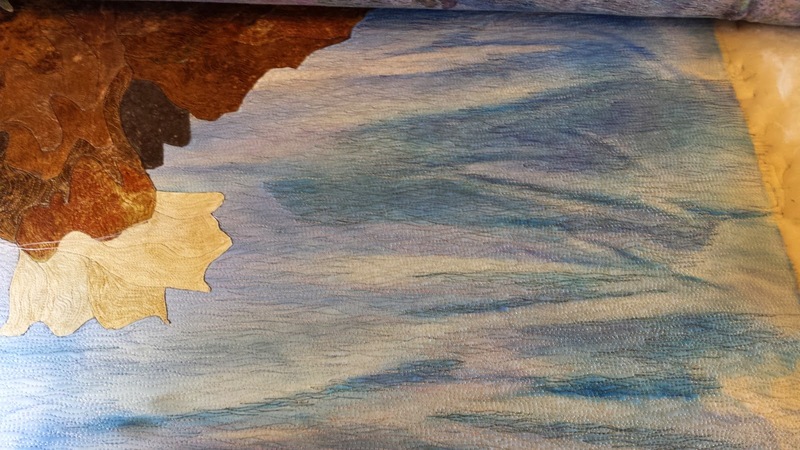 Here is the background started. 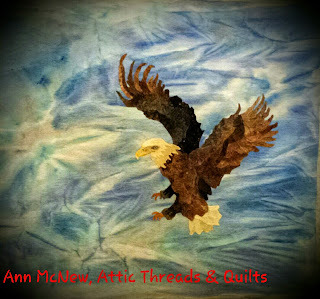 I used the paint color to dictate which color thread for the quilting, blending the colors as I quilted. 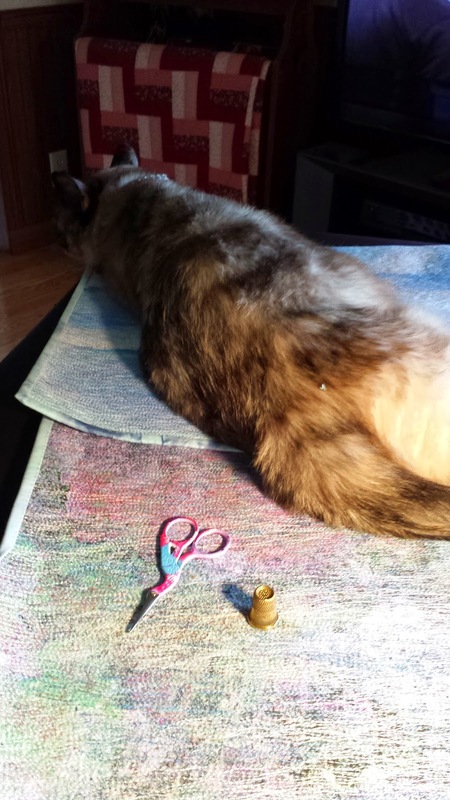 Binding is such exhausting work! Finished! I'm very happy with how it turned out. First quilt I painted fabric for, first thread painted quilt entered in a show! A little photo shop never hurt anyone! I hope you all enjoyed seeing how I created My Eagle, Bird of Prey. Thanks for taking us on a tour of the way you dyed your fabric and made your eagle! You know I always love learning from you!